Highway 12 in southern Utah is a breathtaking journey past some of southern Utah’s most picturesque features, including Red Canyon, Bryce Canyon National Park, Kodachrome Basin State Park, Grand Staircase-Escalante National Monument, Escalante Petrified Forest State Park, and Capitol Reef National Park. The highway explores high desert rock formations, historic sites, badlands, and aspen forests high in the mountains through its course between two national parks. The potential for outdoor adventure when traveling this highway is virtually infinite. The thought of driving this highway ignites an excitement in me like very few can. This guide is setup in a way so as to give newcomers a healthy sampling of what can be found along the winding route over the course of an extended weekend, while also inspiring frequent visitors to potential new sites that may have gone missed. Highway 12 itself can theoretically be driven in one relaxed day, from Bryce Canyon to the town of Torrey, Utah, however that would not allow for much time outside, and much of the draw of this highway actually lies beyond the one-of-a-kind scenery already lining the roadway. Using a three-day weekend schedule allows for enough time to explore its surroundings and get a good taste of the potential of southwestern Utah’s outdoor adventure artery. Options for extended trips and extra outings are laid out along the way for those who have the time to experience more. This can be used either as an actual itinerary or simply as a starting point for further fun. It begins from the southwestern end of the highway and follows it northeast to its terminus in Torrey, Utah. Both lodging and camping options are listed in strategic places, depending on if you’d prefer nights spent indoors or outdoors. Note that supplies can be very limited along the route. Aside from a general store at Bryce Canyon and a small seasonal health food store in Escalante, food can be scarce. Be prepared with meals ready to cook and plenty of snacks to have handy. Since most visitors will be driving in from the southwest via Las Vegas or Arizona, this assumes you’ll be traveling Highway 89 northbound. If time permits, visiting the Grand Canyon’s North Rim as well as Zion National Park on the way are both well worth the stop, time permitting. The southern terminus of Highway 12 can be found between the small communities of Hatch and Panguitch. Within the first couple of miles on Highway 12, you’re immediately treated to something different: Red Canyon. Seen by most as a little cousin to Bryce Canyon National Park, this stretch of the road shoots past exploding cliffs of bright rust and fiery sandstone. And while most people will simply drive through, eager to get to the first destination they’ve heard of, Red Canyon deserves to be seen and enjoyed and will reward those who do so. For those who want a quick taste without eating too much time, the Tunnel Trail is found on the south side of the road just before the beautiful Red Canyon Arch that famously bends over Highway 12. The trail will switchback up a short half-mile path to ascend a hill that overlooks the highway and the surrounding area. The Cassidy Trail in Red Canyon will give visitors a much more in-depth experience with more remote scenery of the eroded sandstone mountains. This trail can be combined with the adjoining Rich Trail to create a fantastically picturesque five mile figure-8 trail, or can also be extended for lengthier hikes or even backpacking trips. The attraction of a national park is what draws most people to this particular area of southern Utah. Highway 12 will ascend to the top of the Paunsaugunt Plateau, where you’ll make a right turn onto Highway 63 to head south to Bryce Canyon National Park. Many visitors are completing a circle that includes Grand Canyon and Zion National Parks, where Bryce Canyon National Park rounds out a grand circle of parks. As such, this will be the most crowded location along the route, especially during peak tourist season. Likewise, with plenty of lodging and a well-maintained campground, it also makes for a perfect place to stop for the night. Bryce Canyon National Park features a number of fantastic hikes, both long and short, each of them giving a uniquely different view of the colorful plateau and park features. If, for whatever reason, you’d rather skip the park but still want to see what you’ve missed, the Mossy Cave Trail is a quick half-mile in-and-out trail that brings you to a mossy alcove, while also branching off to a perennial waterfall, all under the bright blood orange hoodoos. The Queen’s Garden Trail is a fantastic sampling of the hoodoos and geology that Bryce Canyon National Park has to offer. The short in-and-out hike descends through monolithic orange spires that have been eroded over time, into an erratic and shapeshifting rock garden. If time is short, this is the preferred way to see the park. 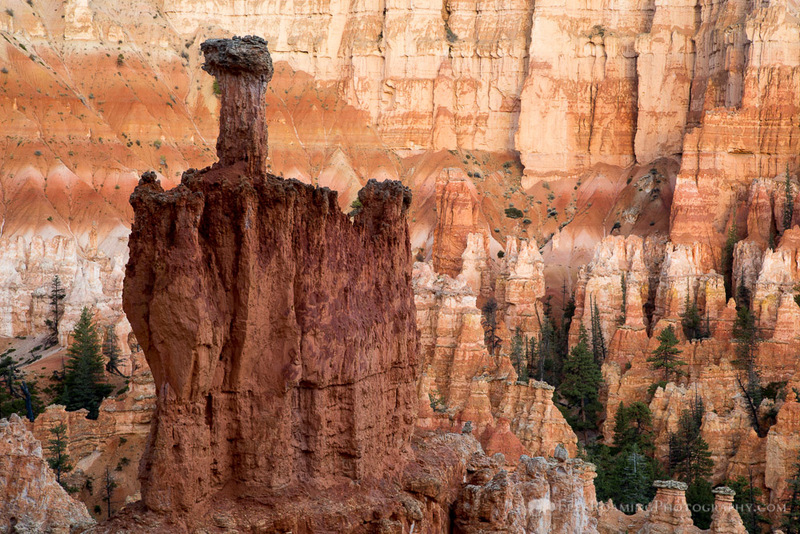 If there’s one hike that Bryce Canyon National Park is known for, it’s the Queen’s Garden to Navajo Loop. This jaw-dropping trail bring you through the aforementioned Queen’s Garden, then deep into a ponderosa pine forest far below the rim where the crowds and noises have been left behind. You’ll then connect with the Navajo Loop farther south before passing through a massive slot canyon carved deep into the sandstone before following switchbacks up to the rim. Want to escape the crowds? The Under the Rim Trail is perfect to get a significant chunk of Bryce Canyon National Park all to yourself. At 23 miles, it makes for a great backpacking trip, giving you scenes from the park that very few ever take the time to explore. The drive from Bryce Canyon National Park to the next night’s stay could technically be done easily in less than two hours. However you’d be passing up a lifetime’s worth of outdoor hiking and recreation opportunities. Back on Highway 12 heading east, the first comes quickly as you’re leaving Bryce Canyon National Park behind. In the town of Cannonville, turn right off of Highway 12 and onto Main Street to head south. This will turn into Kodachrome Road, which will bring you to the underappreciated sandstone landscape of Kodachrome Basin State Park, named so for the old type of film, believing it was the only way to capture the color of the hills and mountains. Within this park are a series of hikes that give you a chance to explore a quiet and peaceful desert landscape below large cliffs of pearl and umber. A well-maintained campground is also in the park, so for those who feel inspired to indulge more, it’s a convenient place to stop and rest. 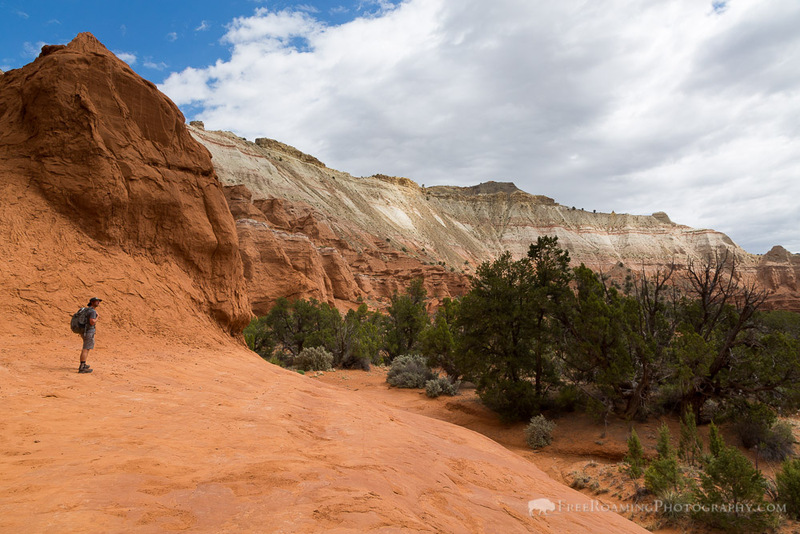 The Angel’s Palace Trail is a quick 1.7 mile loop that brings you on top of a sandstone mesa that overlooks much of Kodachrome Basin State Park. Small spurs from the main trail extend out from the mesa, treating hikers to sweeping panoramic views from above. The Panorama Trail can be as short as a couple of miles, or as long as 6.5 miles. This showcase of a trail winds past some of the park’s most interesting features, including various hoodoos, the Cool Cave, and the titular overlook point. The park has a number of other inspiring trails as well, so be sure to inquire upon arrival depending on the length of your stay. Beyond Kodachrome Basin State Park is the popular but enormous Grand Staircase-Escalante National Monument. It can be accessed both from Highway 12, as well as continuing down Kodachrome Road. 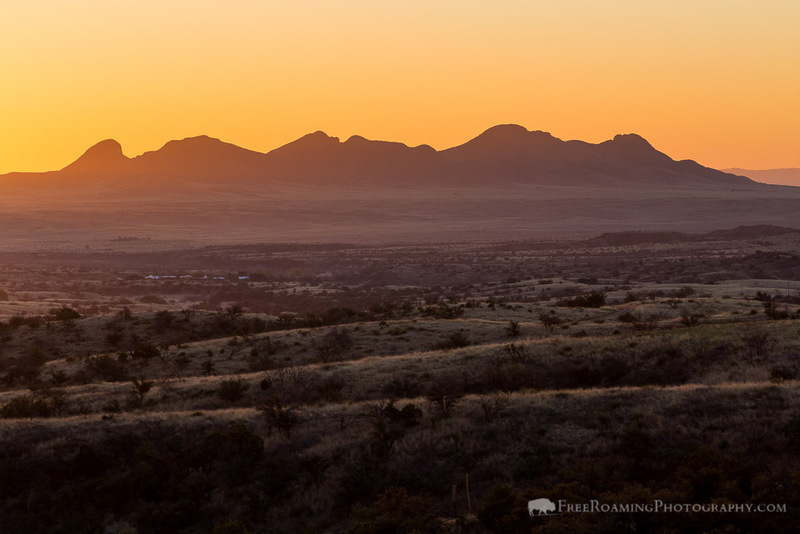 The latter will help you find some of the most remote and rugged high desert terrain in the country, ripe with discovery and exploratory opportunities. The roads, however, are not well maintained, so do not attempt to drive beyond without a high clearance vehicle at least, and ensure there isn’t rain in the immediate forecast. Grovesnor Arch is a short distance from Kodachrome Park and is a shame to miss if you’re already so close. Once past that, the road becomes increasingly rough. Just before the arch, Cottonwood Canyon Road breaks off to the right. Following the road straight will bring to a network of roads traversing the Kaipairowits Plateau. Along the way in either direction are countless slot canyons and makeshift trails waiting for exploration. Weeks could be spent in this area, leaving any visitor wanting more. Heading back out via Highway 12, the roadway passes through small mountains lining both Grand Staircase and private land. 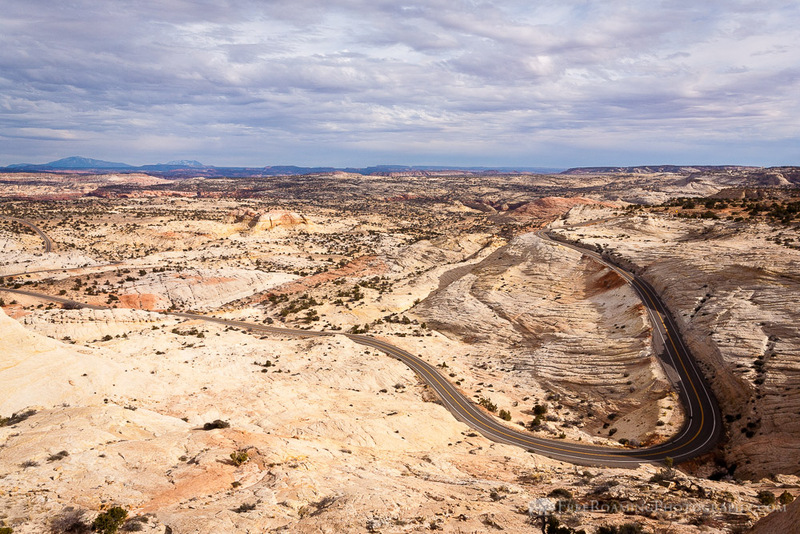 Powell Point Vista is a worthwhile scenic stop along the way as the highway begins to near the town of Escalante. Just before reaching it however, lies a treasure trove of petrified wood. A small state park, Escalante Petrified Forest State Park maintains a short but fascinating hiking trail littered with prime examples of petrified wood. Both large and small samples from huge tree trunk chunks to tiny arrowhead-sized chips line the mile-long trail and further. A small exhibit can also be found on the premises as well as a campground should you want to examine the site more. The town of Escalante has become more and more geared toward the outdoor enthusiast since the creation of Grand Staircase-Escalante National Monument, and its economy around the industry has been steadily growing. The town has a small seasonal health food store, multiple gear shops, lodging, a Visitor Center, and is also known for being the gateway to Hole-in-the-Rock Road, a lengthy dirt road that grants access to dozens of trailheads. The road was an old route for Mormons, who literally had to bring their caravan through a hole in the rock at the end of the road for successful passage. Like many areas in this region, weeks or even months could be spent exploring the trails along this road. It’s remote, quiet, and ripe with adventure opportunities, though be aware the road’s quality deteriorates the farther its traveled. Note that it’s strongly recommended that you do not enter the road if there’s been rain, or there is rain forecast during your visit. The road can very well become impassible. The Devil’s Garden is a short, unmaintained jaunt around a mass of sandstone rock protruding from the ground. It contains hoodoos, arches, and plenty of slickrock to scramble around and explore. The trail is less than a mile and can be easily done to break up the day with a short outdoor walk in new terrain. Two of the more popular slot canyons in the area, Spooky Slot and Zebra Slot, will transport you into another world as you become enveloped in striated sandstone that wraps around you like an earth-toned blanket frozen in time. For those with a bit of claustrophobia, you can either challenge yourself with these hikes, or enjoy the scenery leading up to the slots. 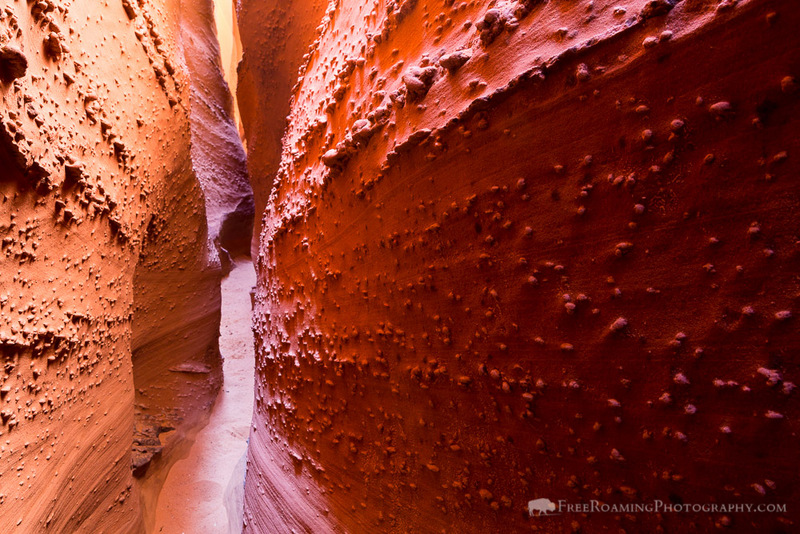 To watch the landscape evolve around you into a slot canyon is a spectacle in itself! If you have the time and you want a taste of what the area really has to offer, Coyote Gulch has become the place to visit, and for good reason. 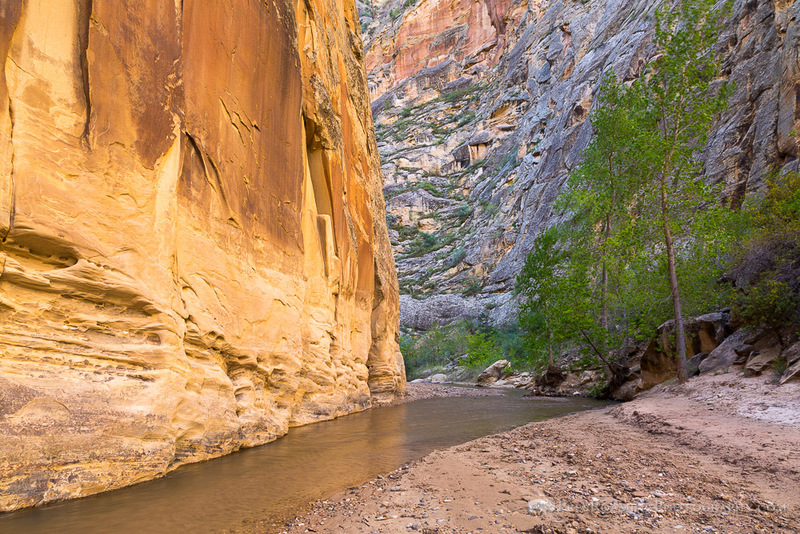 Backpack in for one or more nights to explore the remote desert canyons and chasms that feed the quietly powerful Escalante River. Down in this eroded sandstone canyon, you’ll find natural arches bending over cottonwood trees and creeks, creating a desert oasis unlike anywhere else. After passing an overlook that stands above sandstone slickrock as far as the eye can see, Highway 12 will soon drop down to cross the peaceful Escalante River. You’ll want to make sure you have flip-flops or sandals to explore the river’s winding path. An easy, meandering trail lines the river, frequently crossing it. You can head upstream or downstream for as far as you’d like (ie, more backpacking opportunities), easily exploring it for less than an hour, or for days. An Escalante River trailhead can also be accessed via backroads from the town of Escalante, where many argue is the more scenic stretch of the river. However, both areas will dwarf you beneath massively carved sandstone cliffs and will guide you along the river, removing you from any signs of civilization, giving you a peaceful respite in a desert oasis. As you begin to ascend Highway 12 from the Escalante River, you quickly reach the trailhead for Lower Calf Creek Falls on the left, which also has a maintained campground on the premises. This is actually the only maintained trail and campground within Grand Staircase. The trail is an easy three miles each way, and takes you up Calf Creek. At the three mile mark, you reach a beautiful emerald waterfall dozens of feet high, pouring over sandstone cliffs and into an inviting pool. The trail also features petroglyphs for the keen observer. Should you be ready to call it a day, the campground at the trailhead is an inviting place to relax. Highway 12 climbs and wraps around the Lower Calf Creek Falls area to climb onto a ridge known as the Hogsback. This stretch of the highway snakes along the razor’s edge of a sandstone ridge high above the surrounding slickrock scenery. On either side is a drop of several hundred feet or more. Take advantage of the strategically placed pullouts to admire both this feat of engineering, as well as the outstanding views of the high desert country surrounding you. Boulder, Utah is a small community found just north of the Hogsback along Highway 12, propped up in the southern foothills of the Boulder Mountains. Ready for a break from the outdoors? (It’s ok. I won’t tell.) Visit the Anasazi State Park Museum, then enjoy a freshly cooked and delicious farm-to-table meal from the Hell’s Backbone Grill. Lodging can also be found here, and makes for a great second-night’s stay. On your way north (east) on Highway 12 from Boulder, you’ll quickly begin climbing the Boulder Mountains. This area is part of the Dixie National Forest, also encompassing Red Canyon at the west end of the highway. As with many national forests, as well as paths along this road trip, countless trails can be found to explore, both on foot and by car. 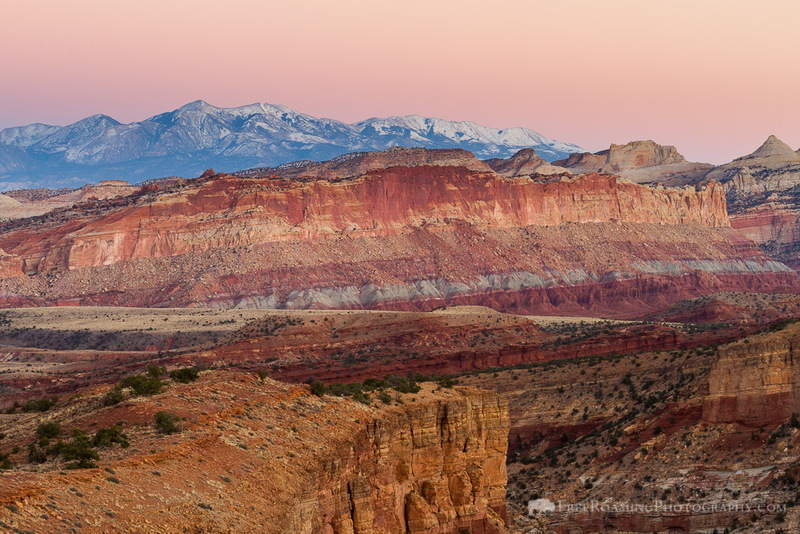 If you’re short on time, however, the there are multiple pullouts along the highway that offer dramatic views from the mountain forests down to the desert landscape of Capitol Reef National Park. The Boulder Mountains commonly go overlooked by visitors, both because of their geographic location, as well as their lack of general attention. However awaiting just off of Highway 12 is a mountain paradise ripe for exploration. Roughly 14 miles north of Boulder, look for Forest Road 554 on your left, and take that approximately 1 mile in to access the Great Western Trail. A steep 1-mile trail will bring you high to Boulder Top where unparalleled views eastward unfold. Enjoy the views from the alpine forests stretching out to the rocky deserts below. Though easily ascended from a nearby dirt road, the highest point in the Boulder Mountains is not easy to get to. Once there though, the network of roads and trails from Bluebell Knoll bring you deep within the range to display alpine lakes, forest, and mountain scenery, with panoramic views of the desert far below. Likewise, a number of options for exploring both on foot and in your car fork out in many different places. Get there by backpacking in from a number of the dirt roads and trails that access it, or by following a network of rough forest roads. Capitol Reef National Park continues to be one of the most underrated and overlooked national parks in the country. It receives a fraction of the visitors the other four Utah national parks do, but is easily one of the most captivating and mesmerizing. The park is based around a giant “wrinkle” in the earth’s crust known as the Waterpocket Fold, revealing sandstone and rock layers millions of years old that rivers and streams have carved through. Sunset Point and Goosenecks are two trails above the Fremont River in Capitol Reef National Park that both add up to less than a mile. They provide an excellent vantage point of much of the surrounding terrain and the signature Waterpocket Fold of the park. The two short trails make for a great glimpse into the park for those short on time. Navajo Knobs is a eight-mile round trip hike along the rim of Capitol Reef National Park’s Waterpocket Fold that culminates on top of an exposed point of Navajo Sandstone. Tremendous views of the park and the Waterpocket Fold itself gradually expand out below as you climb higher and higher on the rim. The trail is never terribly steep and even features a beautiful overlook at roughly halfway that makes for a great turnaround location if you’d prefer not to hike the full distance. Upper Muley Twist Canyon in Capitol Reef National Park is an adventurous nine-mile hike that brings you along narrow sandstone canyons, and then up to top of the Waterpocket Fold. Sweeping and distant views of Strike Valley and beyond sprawl out far below for nearly half the hike. The trail is found in the more remote southern area of the park along the seldom-traveled Burr Trail. The Burr Trail passes through Capitol Reef National Park heading westward, and slithers through Grand Staircase-Escalante National Monument before reaching its western terminus back in Boulder, which you can use to make an extra loop for extra miles on the trip. Highway 12’s eastern terminus will drop you off almost literally in the middle of Utah on another obscure highway known as Highway 24, passing through both Capitol Reef National Park and the town of Torrey, depending on which direction you go. Heading west can indirectly bring you back to I-70 for easy access back to either Salt Lake City or Las Vegas via I-15, while heading east will bring you to entirely new terrain and parks in southern Utah. East from Capitol Reef National Park will provide access to the San Rafael Swell, where a whole new expansive playground opens up north of Hanksville, while traveling east on Highway 95 from Hanksville will guide you past Glen Canyon National Recreation Area, Bears Ears National Monument, and Natural Bridges National Monument before intersecting with Highway 191 where even more potential adventures await. You’re only limited by the time and resources available to you. It’s a good idea to know where you’d like to go after leaving Highway 12, whether it’s out for more adventure or to an airport, so that you know which direction to head in. It’s also recommended you bring an old fashioned paper atlas along with you in the event you encounter some weak signals that don’t give you full access to navigation apps. As mentioned, this is a good itinerary for an extended weekend, but don’t stick to it. Allow time to experience the unexpected, because there will be plenty of it, and most importantly, relax and enjoy. That’s one of southern Utah’s greatest gifts to its visitors.